Professional technology is evolving. How does it impact your business? 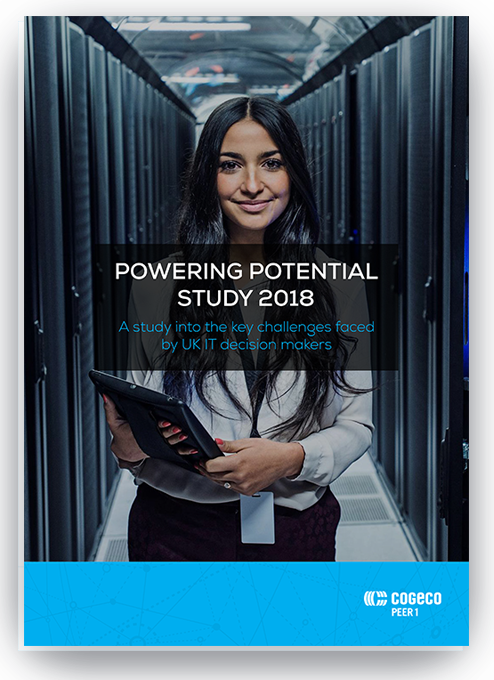 The 2018 Powering Potential Study explores the key challenges faced by IT decision makers and offers insight into the ways technology impacts business. Get your copy. Recently commissioned by Cogeco Peer 1, the Powering Potential Study questioned 150 IT decision-makers working across several industries – financial services, retail, higher education, business services and media – looking into the real value of service and the extent to which technology can liberate or restrict a business. The survey revealed that more than half of organisations struggle to keep up with new advances in tech. It also revealed that 85% of respondents believe that their organisation would see faster business growth if IT vendors were less restrictive, and 8 in 10 think their company is not currently running the optimum IT system. What do businesses consider to be the real value of IT service? How supported do business feel during this time of rapid change in the technology industry? To what extent do complexities prevent businesses from achieving their goals? When an IT partner can respond to these three concerns, they can deliver exponential value to the business. Go 1 Better: see how Cogeco Peer 1 does it. You need a technology partner that delivers the agile, always-on services your clients and customers demand. With Cogeco Peer 1, gain agility and economies of scale through a hybrid infrastructure solution, whether it includes cloud, multi-cloud, bare metal, hosting, colocation, or on-premise. Get in touch with us to learn more about how we can help you with your current and future hosting needs.